The houliday house is located directly on the beach on the island of Pasman, and it is available to rent throughout the year. 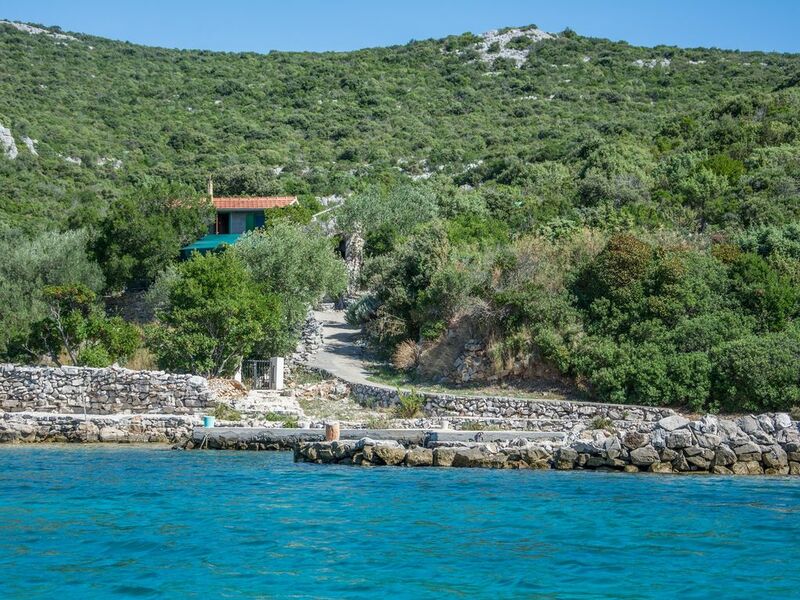 This island has a regular connection with the mainland - it takes about 15min with the ferry to get to the island from Biograd na moru, and the ferry is leaving more then 10 times a day. This holiday house to rent can accommodate up to 6 persons, as it has three seperate bedrooms two with a queen bed and one with a bunk bed. The kitchen is equipped with cutlery and crockery, refrigerator with freezer compartment, cooking stove on gas, and a fireplace. Tvrdica also offers you barbecue and outside shower. This is a pet-friendly accommodation - pets are on request and against surcharge welcome (5,00 EUR per day per pet).The house is accessible by car to about 50m distance, on a makeshift and somewhat coarse (gravel / earth) road over the hill, that can be affected by weather conditions. For this reason, these roads are not recommended for lowered cars, but that does not mean that you necessarily have to have an SUV or a four-wheeler. These roads are passable for a normal car, with slow and careful driving. The advantage of having your car by the house is that you may easily go on trips and explore not only the immediate, but also the wider area, which offers many attractive excursion locations. Parking in the bay of Landjin is free of charge. Ferry tickets are not included in the price.The other possibility is to leave your car (one per group) on a free and secure parking, in the village of Pasman, on the island of Pasman. Transfer from this parking place to the house once upon arrival and back to the car once at the end of your stay is free of charge. In the booking process please inform us if you choose an access by your own car or the service of transfer. Ferry tickets are not included in the price.The fresh water reservoir holds 20.000 l. Electricity is generated by solar power, 220 V, but regrettably no household appliancies may be used except of battery rechargers and lights. Running cold water is installed in the kitchen and bathroom. The toillet uses sea water for flushing. The outside shower functions on the principles of free fall, with water from the reservoar. Water and electricity should be spent sparingly here. This water is originally tap water, but as it is staying in the tank in hot weather, we recommend it to be boiled before drinking, or that the users of accommodation would purchase bottled water for drinking.Minimum stay is 7 days, from Saturday to Saturday only. Rentals during winter are possible, but water can only get heated on the stove, and heating materials will create an extra cost.Bed linen are prepared for you. Fresh bed linen arrives once a week. Bathroom towels and beach towels are not available, please bring your own. Bring along your cell phone, so you can contact us in case of need. Mobile phones can be recharged in the house with your regular home charger. There is the possibility to rent a motorboat (on request, and provided that the client owns an acknowledged boat driver´s license).Kindly check in during the morning till early afternoon at our agency, because the transfer and the arrival to the reserved accommodation unit is very inconvenient at night. After the check-in in our agency you will travel to the island. If you find these details unclear or you have any further questions for which answers can not be found here, please contact us. The Agency can not be held responsible if the customer does not inquire for the details that are important to him but are not mentioned, or for details of the object which are out of any reason not completely clear to the customer. Tkon (otok Pašman) est la bonne destination pour vos vacances? Hardy est le nom de ce logement, situé dans la destination Tkon (otok Pašman). Ce logement est distant de la mer a 20 m par distance aérienne. Pendant les jours d'été, cherchez des rafraîchissements pour vous et votre famille sur la plage qui est a une distance de l'objet 20 m. La plage est: les petits graviers. Pour rester sur la plage, assurez-vous de porter des serviettes et de vous protéger du soleil avec un chapeau ou un parasol et d'utiliser une crème protectrice. Pendant vos vacances, la plupart des gens aiment cuire du poisson ou de la viande pour le dîner ou le déjeuner sur un grill. Et après le dîner profiter de la nuit dans une compagnie chaleureuse. Le logement "Hardy" a un Barbecue, donc si vous aimez les barbecues, vous aimerez vraiment rester dans ce logement. Si vous voyagez avec un animal domestique, vous serez agréablement surpris avec ce logement car il a la possibilité de recevoir les animaux domestiques. Animal de compagnie accepté uniquement sur demande auprès de l'agence (paiement auprès du propriétaire). Si vous avez d'autres questions concernant la plage ou la destination Tkon (otok Pašman), veuillez-vous renseigner auprès de vos hôtes car ils connaissent toujours mieux la location ou la ville. Nous vous souhaitons la bienvenue dans notre établissement Hardy à destination Tkon (otok Pašman). L'hébergement Hardy se trouve à 20 m de la mer, À 5000 m du centre de Tkon (otok Pašman). La plage est de les petits graviers. L'hébergement privé Hardy est idéal pour 6 personnes et a 3 chambres à coucher dans l'hébergement. Animal de compagnie accepté uniquement sur demande auprès de l'agence (paiement auprès du propriétaire). Za one željne odmora bez ogromnih gužvi na plažama, savršeno. fantastische platz in d.natur , problemlose autozufahrt , parcken 45m vom haus. in d.kuche kein abfluss , kuhlschrank zu klein.